Kevin Manganaro represents clients in litigation, focusing on matters involving consumer financial services issues. He works with his clients to ensure they are informed throughout the litigation process and provide them with simple, tailored solutions for their complex legal problems. 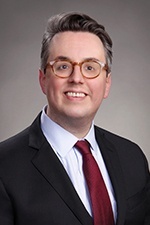 A former Assistant Attorney General for the Massachusetts Attorney General's Office, Kevin has extensive experience in the area of public transparency. He has also represented agencies and the Commonwealth at administrative hearings and in state and federal court. Prior to joining Hinshaw, Kevin was an Assistant Attorney General with the Government Bureau of the Massachusetts Attorney General's Office. While there, he interpreted and enforced public transparency laws—FOIA, Open Meeting Law and Public Records Law—and conducted investigations and depositions of public officials. He was also a judicial law clerk for the Honorable R. Marc Kantrowitz (ret. ), Massachusetts Appeals Court. During law school, Kevin gained experience from several internships and clerkships in both New York and Boston, including working as a legal intern for the Litigation Bureau of the New York State Attorney General's Office. Before embarking on his legal career, Kevin worked in sales and marketing for Theatre Direct, Intl./Broadway.com. A native New Yorker, Kevin resides in Medford, Massachusetts with his domestic partner and their wonderful rescue cat.